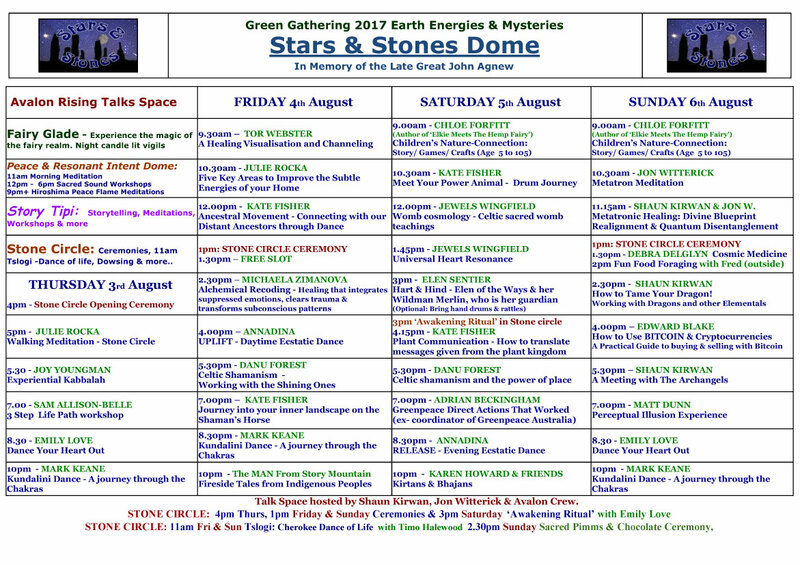 This year in Earth Energies we are packed with cutting edge, spiritually challenging, consciousness changing, inspiring, loving, practical, and fun talk-shops, from morning till midnight! 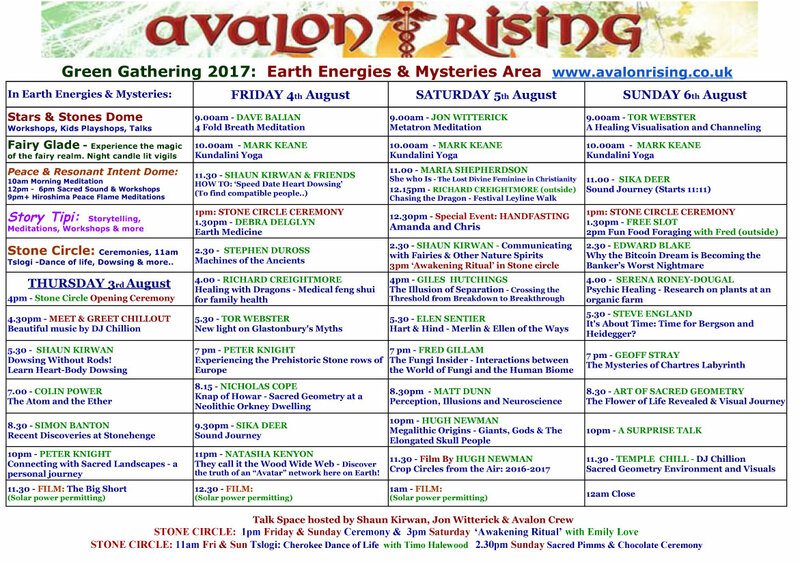 Schedules will be on our website www.avalonrising.co.uk and at info point and outside Avalon Rising marquee. In our talks tent at Avalon Rising we have, Giles Hutchings, the illusion of separation, Matt Dunn the nature of perception, Nicolas Cope talking about the Orkney site Knapp of Howe, Sika Deer is doing two fantastic sound journeys inc. didjeridu, Art of sacred Geometry is showing the flower of life revealed, Tor Webster Glastonbury Myths, Geoff Stray Mysteries of Chartres Labyrinth, Familiar speakers at the green include Hugh Newman Megaliths from around the world, Fred Gillam – Mushrooms, Serena Rondney-Dougal – Psychic Healing and plants, plus many more.. Don’t forget our stone circle ceremonies Thursday 3.30 Friday 1pm & Sunday 1pm. 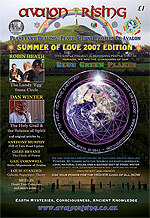 Star & Stones workshops. 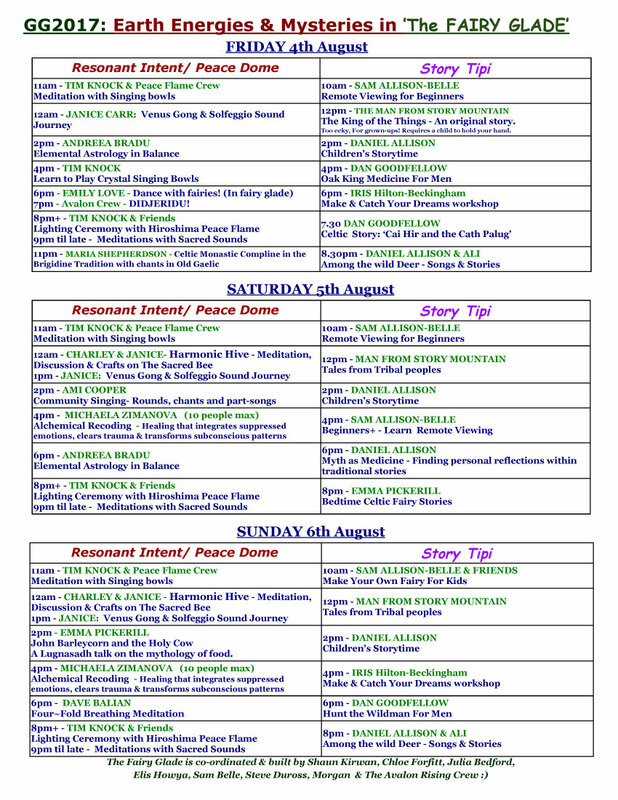 We are excited to have back after missing the last few Green’s Jewels Wingfield, running beautiful interpersonal healing workshops on Saturday, and we also welcome back Danu Forest – Celtic Shamanism, Mark Keane – Kunderlini Yoga, Shaun Kirwan – Nature Spirits, Dragons and Angels and New this year Annadina – Ecstatic dance and Kate – Fisher Plant communication plus many more.. The Fairy Glade. We are doing something really special this year in the fairy glade! But access is strictly after 4pm Thursday. Late night candle lit surprise walkabouts. Story Tipi. Stories with Daniel Allison, The man form Story mountain and others. Also Story telling workshops and nature meditations.